Heretic Knives H007-6A Hydra DLC OTF Knife FREE SHIPPING! have many automatic knives to choose from. The Heretic Knives Hydra DLC is a premium out-the-front automatic knife. It features a reliable button safety that can be disengaged with the thumb, revealing the deployment button. 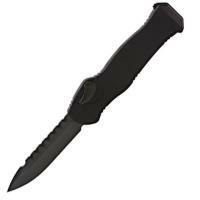 A titanium tumbled spring deploys the blade extremely quickly for immediate action. When finished, holding the button while pulling on the charging handle resets the mechanism and returns the blade. Its drop point shape and sharp plain edges make it highly versatile, capable of piercing and slicing with equal ease. Jimping on the reverse edge provides increased control for delicate work. A black DLC coating reduces wear on the steel and prevents reflections from giving away your position. The handle is made from aluminum, and comes with carbon fiber grip panels and a convenient double-prong pocket clip. ©2002-2019 CopsPlus.com: Heretic Knives H007-6A Hydra DLC OTF Knife FREE SHIPPING!